Along the Boquillas Canyon Trail. “You going down to the canyon? asked the guy walking into the parking lot. He had come from the Boquillas Canyon Trail, the same one we were about to check out. “Yeah” I responded with a nod. Not the typical pre-hike conversation I was used to having with someone coming off a trail. “The trail is nice”, “The view is worth it”, “The climb out is tough” were more common pre-hike exchanges you have with fellow hiking strangers. But Victor? Singing? What were we getting into? Christmas carols blared outside of lawn & garden as we drifted to sleep in a parking lot on the edge of Fort Stockton. It seems that Big Bend National Park is way down in West Texas. Way down. A bit out of our way and right on the way to Kentucky all at the same time. It was a park Jill had visited before and one I had not. One we opted not to visit on our road trip in ’09 because I wanted to get to a destination where we could climb. A park that made perfect sense to visit this time out. It was December and the daytime temps were warm, it also put off getting home. We’d awake the next morning and drive on down for a few nights of National Park fun on the border. The Rio Grande with the Chisos Mountains rising out of the background. Through miles and miles of rolling hills and Texas scrub we came to the park entrance, only 46 more miles to Rio Grande Village. The rolling hills gave way to the Chisos Mountains, the scrub continued. We quickly settled on a campsite, this being off season we had our pick of the litter, and headed out for a little hike to the mouth of Boquillas Canyon. Easy. One point four miles round trip. Let the hustle begin. “We’ll check that out!” I hesitantly responded to the guy in the trailhead parking lot. 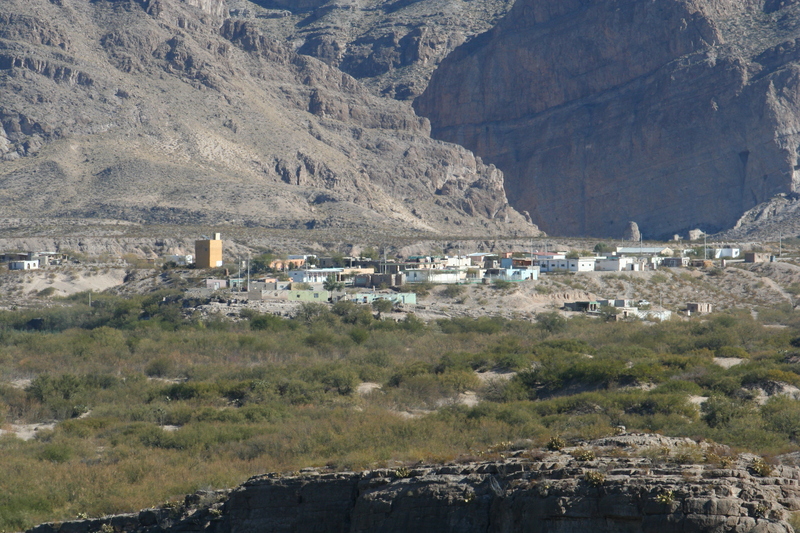 The Mexican village of Boquillas lies in a bend in the Rio Grande at the mouth of an massive canyon. We had read about the trinkets that the people of Boquillas made to sell to the tourists. It was illegal to buy directly from them, instead you could legally purchase them in the park’s visitor’s centers. For a marked up price of course. You see Boquillas was a small village on the south side of the Rio Grande River. The Mexican side of the river that separates the first world from the third world along Texas’ winding border with Mexico. Back in the day you could pay a fare and take a boat to Boquillas to buy a bite to eat, cervezas and trinkets. If the river was cooperating you could also wade. That is what Jill did back in 1994, lucky duck. Then came the attacks of September 11th, the lock down of our Nation’s borders, the and the end of tourism as Boquillas knew it. With no official border crossing in the park, the nearest one 50 plus miles away, a visit to Big Bend National Park changed. Gone was the carefree day trips to Mexican border towns like Santa Elena or Boquillas and here to stay was the presence of the US Border Patrol. We followed the trail out to the parking lot and quickly climbed to the top of a low hill with dramatic views of the twisting Rio Grande and sweeping canyon walls. And there it was by the trail, the hustle. A small pile of trinkets and walking sticks complete with a price list and payment can. Really? Right here? Huh? It wasn’t a sight I thought I’d see. All the park propaganda warned of purchasing crafts off of Mexican residents, not from a trail side flea market stall. OK it wasn’t that bad, more interesting than anything. Instead of direct sales it was more on the honor system. Slide over and leave your wares at the busy tourist spots in this popular border park and come back later to collect the profits. It only got more interesting. Remember that guy we met in the parking lot? Something about Victor and a song? As soon as we reached the edge of the river and turned downstream toward the entrance to the canyon it started. The sound of the rippling river was interrupted by the distinct sounds of song. Mariachi? Tejano? Whatever it was it didn’t matter, somewhere out there in the Texas or Mexican river grass was a guy singing to us. We stumbled onto Victor’s collection cup soon there after. Victor (lower left) and his amigo chillin’ on the river bank. And to think we missed the singing of Jesus?!? Amigos! Amigos! I’ll sing you a song. Never mind he already had, Victor was channeling a carnival barker to drum up a donation for more singing. 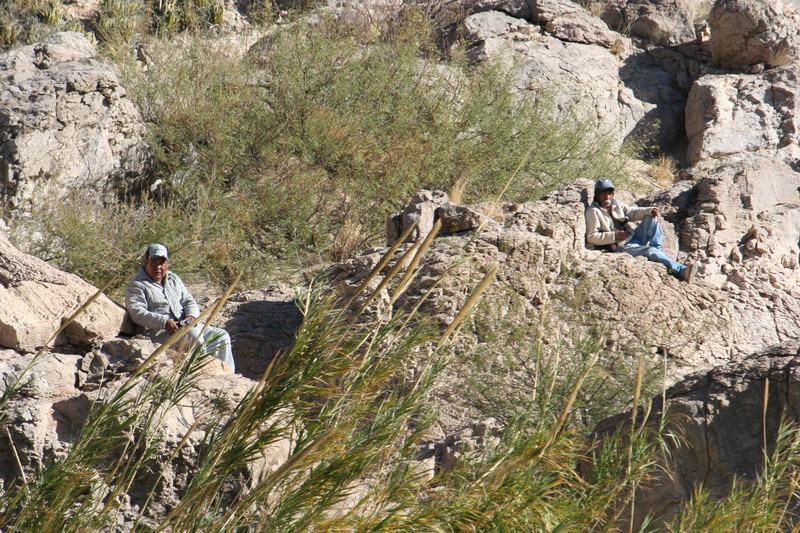 Sitting on the Mexican bank of the Rio Grande with his amigo, he would wait for his audience. Binoculars insured he earned his wages and made sure they didn’t walk off. Its how he made his living, or so he said. We continued on down river to the end of the trail. Sand stacked up to make a large dune against US side of the canyon, sheer limestone walls rose up out of the river on the Mexican side. It was beautiful. But unlike other National Parks where the hustle was contained to the man made villages of commerce catering to the tourists, this place had it out on the trails too. We started back up the hill to the parking lot and were met by border patrol agent. Of course he is a Cowboys fan! “Did Victor sing you a song?” asked the agent. Could it be Victor’s? A boat moored on Mexican side of the river. We chatted with the agent a bit longer and were on our way back over the low hill to our van. 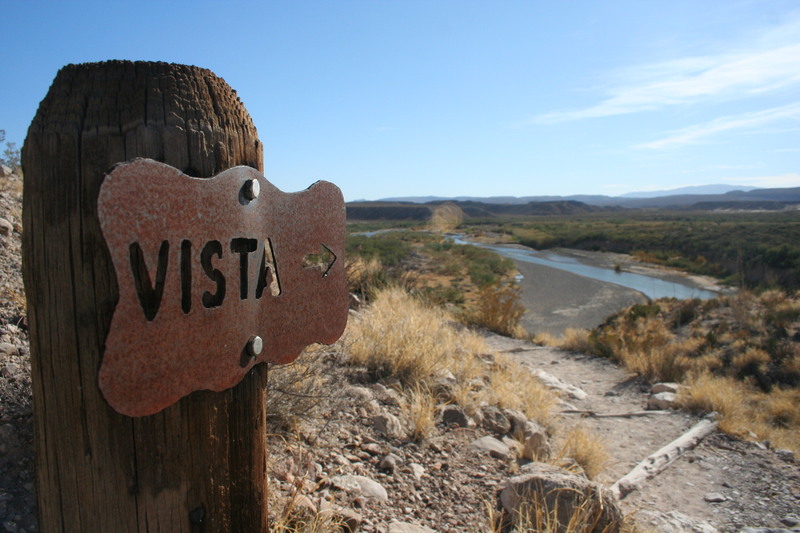 The setting was ideallic outdoors, but my mind was transfixed on Victor, Boquillas and life on the border.